➡ View the complete range of Copper Earth Bars – contact us for technical support, stock availability and competitive quotations. As the UK’s largest distributor of copper earth bars we can provide excellent service for the complete range of Earthing & Lightning Protection products including copper tape, rods, clamps and ancillary items. 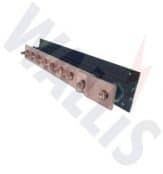 Substation earthing bars (LV HV) are used to marshall earth connections, connect copper earth rods or earth cable conductors using crimp lugs for terminations in substations, cable pits, feeder pillars and switchgear. Note: At new enclosed high voltage substations the HV earth bar within the LV feeder pillar shall not be used to marshal the earthing connections as access, particularly at IDNO substations, to the LV cabinet/pillar is not always available. However it is acceptable to use the HV earth bar within the LV feeder pillar at existing outdoor sites for all earth connections to prevent theft.